Mountainous Saint Lucia is a beautiful and volcanic island has all-inclusive resorts in the form of 3 Sandals properties that participate the Stay At One, Play At Three program. On the picturesque island of Antigua there are 365 beaches. That’s one beach for every day of the year! This elegant oasis is located only 5 minute from the airport. With skypools, private plunge pools, living rooms inside pools, river pools and any other pools you can think of, Sandals La Source can provided you with an extensive amount of luxury in the southern Caribbean. The sophistication here is unparalleled. The only thing that comes close to the level of attention to detail is the quality of the dining experience. We’re honored to be a Sandals Chairman’s Royal Club agency of Sandals Certified Specialists – getting you VIP treatment at Sandals Resorts in the Caribbean! Click here! Plan your honeymoon, destination wedding, or romantic Caribbean getaway to the adults-only, all-inclusive Sandals Resorts – where love is all you need! Luxury Included getaways to St Lucia, Antigua, Bahamas, Jamaica, and Grenada await you with spa treatments, luxury accommodations, fine dining, beautiful beaches, and adventurous tropical excursions! 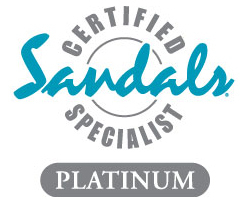 Our commitment as Certified Sandals Specialists and proud members of the Sandals Chairman’s Royal Club ensure your VIP treatment at all Sandals (and Beaches) Resorts!